This was a much anticipated match after both won their opening matches. Algeria were still buzzing from their victory over the mighty Germans. Austria had eased past Chile although the 1-0 win would suggest otherwise. Both teams knew the winner of this match would definitely go through to the next phase. Both sides had decent penalty shouts in the first half and Algeria found Koncilia in fine form in the Austrian goal. 10 minutes into the second half and Austria came forward and Welzl’s shot was blocked but the ball fell to Walter Schachner who swung a foot at it and his shot went in off the post. 10 minutes later Welzl, who’d only come on at half-time, was again involved as he brought the ball forward after an Algerian attack had broken down. As the defence struggled to work out who to mark, they left the most dangerous player, Hans Krankl and he fired a left foot shot from the edge of the area in for the 2nd goal. Austria were 2 wins from 2 games and through to the next round. France had been beaten by England in their opening game whereas Kuwait had earned a creditable draw against the Czechs in their first ever World Cup match. This game became infamous for what happened towards the end of the match, but for the first half France were the more dominant. Just after the half-hour France had a free-kick just outside the area just right of centre and Genghini curled a beautiful shot over the wall and into the top corner for the opening goal. Six had the ball in the net earlier, but it was ruled offside when Giresse played a one-two and had run too far ahead of the ball for the return. Then just before the break, Giresse played Platini in and he calmly passed the ball into the net, past Al-Tarabulsi. It was as simple as they come but underlined the sheer quality of this French midfield. France began for the second half, where they left off in the first as Platini played a lovely ball over the defence for Six to take it on the chest and then meet it on the half-volley to put France 3-0 up. Maxime Bossis then surged forward, played a one-two with Giresse and was put clear of the defence to round the keeper and score, but the flag went up for offside and the goal was ruled out. Kuwait then got a goal back when a quickly taken free-kick gave Al-Buloushi the chance to score. France then had the ball in the net again, but Amoros was adjudged offside after he’d come forward from the back looking to get in on the act. Then the fun and games began. Another good passing move saw Platini play Giresse in and the Kuwait defence stopped because they heard the whistle. However, the referee hadn’t blown his whistle and Giresse was most definitely not offside, but when Giresse went onto score the Kuwait players were incensed. Not only the players but the management and even the President of Kuwait FA in the stands, and he ordered the players off in protest. The game was held up for about 15 minutes and unbelievably the referee ordered a drop-ball to resolve the issue. Had the French been losing at the time it is hard to see them agree to this solution, but they got on with it and eventually scored their 4th goal. But not before the 5th disallowed goal of the game when Kuwait had the ball in the net. A header looked to be going in when inexplicably, Al-Dakheel, who was in an offside position, helped it over the line. Had he left the ball he may not have been flagged for offside. Then in the 90th minute, Bossis forced his way forward and then fired the ball in from a tight angle. 4-1 was a good response to their defeat to England and with the Czechs also losing to England, the French knew a draw against the Czechs may be all they need to progress. 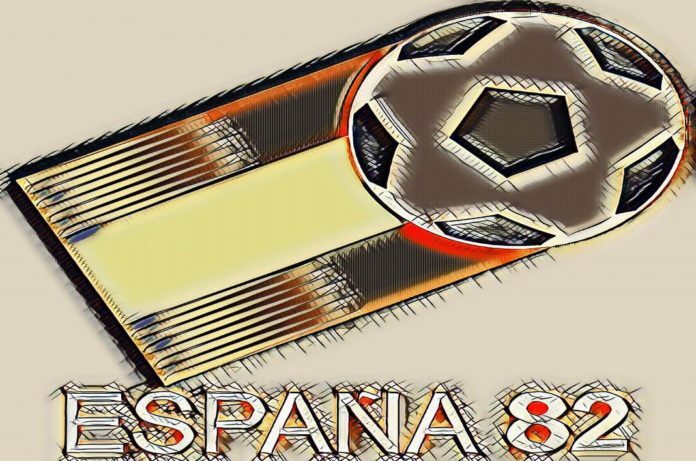 Both countries had drawn their opening game and with Spain winning the night before, they knew a win here would go a long way towards securing a place in the next round. The Irish were soon on the attack and a left-foot cross from Norman Whiteside into the area found Martin O’Neill free, but his header went over when he really should’ve done better. 10 minutes in and Ireland had a free-kick over on the left wing. McIlroy curled it in right-footed, it hit the bar, bounced down for Chris Nicholl to head it against the bar again, where Gerry Armstrong was on hand to head the ball over the line and the Irish were in front. Many were expecting an avalanche of goals but the Hondurans were made of sterner stuff. Not long after, Betancourt saw his shot hit the bar of Jennings goal and bounced back out again. Towards the end of the half, Armstrong hit the post with a shot as the Irish tried to force a 2nd goal. Early in the second half, Whiteside thought he’d scored his first international goal but it was disallowed for Hamilton’s push on a defender as he headed the ball down for Whiteside. On the hour, Honduras had a corner on the right and it was met by Betancourt whose bullet header was superbly pushed over the bar by Jennings. The resultant corner was then headed in by Laing on the near post. Both teams had chances to add to their tally, but it ended 1-1. Northern Ireland would now need to get a result from their last match against the hosts. So that concluded the second round of matches in the opening Group Phase and some countries were in good shape, others still had work to do. Some of the first timers were well placed to progress. The final group matches weren’t played simultaneously as this was the tournament which created the need, or cynically exploited the lack of it, depending on your point of view. In Group One all four matches had ended in stalemate, with some absolutely turgid stuff served up. Cameroon were looking at the possibility of going through at their first attempt. The two big sides, Italy and Poland, were in danger of an early summer holiday. In Group Two, Austria had won both matches but weren’t certain of qualification. West Germany had bounced back from their humiliation at the hands of Algeria. If they beat Chile then Algeria could go through, although goal difference could be important. In Group Three, Belgium were in a similar position to Austria. They’d won both matches but could still be overhauled by both Argentina and Hungary. Argentina, like West Germany, had recovered from an opening loss and improved their goal difference equally. Hungary had begun with a record win over El Salvador, but the thumping they received at the hands of Argentina now put their progress in doubt. Group Four was dominated by England. Their impressive win over France had been followed with a less convincing win over the Czechs. They were already certain of qualification as France and Czechoslovakia played each other so both couldn’t overhaul England. The Czechs failure to beat Kuwait meant France just needed a draw against them in their final match to go through. In Group Five things were almost as tight as Group One. Spain’s win over Yugoslavia put them top of the group as all the other matches had been drawn. Honduras were sitting in second place on goals scored. If they could beat Yugoslavia they would be through. Northern Ireland were well in with a chance of going through, but they had to come up against the hosts in front of a vociferous crowd in Valencia. Group Six was all about Brazil. They’d had to work hard to get past USSR in their opening game, but turned on the style against Scotland. Scotland now had to beat USSR as a draw would see them go out on goal difference, for the third World Cup running. New Zealand were definitely out but still had a game against Brazil to look forward to. Next articleWorld Cup 1982. Day-by-Day. Day Ten. Poles Apart. Scots Crash Out. Just turned 50, I write about the football I've witnessed over the past 40+ years. A Liverpool fan, my first season supporting them was Paisley's first title. Other than Liverpool, my two other loves in life are my wife and my dog.